Interesting & Odd – Tell my story. Towards the end of December, I came across an excellent interview conducted with Emmett’s close friend Minnie Kehoe. The text of the interview is below, along with the original source information. Note that this wasn’t exactly an in-person interview; Minnie apparently took issue with one of the articles published by The Typewriter and Phonographic World, sent extensive comments supported by data, and included a photograph of herself — talk about a sistah who was sassy AND thorough. This was an excerpt of the interview, by the way. Page 279 of the same publication is another (different) article. You can find the article, published in The Journal of Commercial Education, volume 24, at this link. I turned immediately to all of my known and collected documents — and breathed a huge sigh of relief. The “Mrs.” is a typo. Of course. I should know better — after all these years of researching Emmett, I’ve learned to take many of the articles written about him with a major grain of salt until I’ve done the background checking on the information. Editors interesting in pushing their agendas (I’m looking at you, Frank Mayes) said what they wanted about Emmett regardless of fitness for office, or the truth. I should also know better than to read this stuff at 4 a.m. with only one cuppa under my belt. Here’s a great article from Atlas Obscura on a once popular fad, picnics in cemeteries. Actually, I think it’s great — I’m not just saying that because I like to hang out in cemeteries ‘getting to know’ the individuals who will play prominent roles in Emmett’s book — but there’s so much one can learn from cemeteries beyond the birth and death dates. And here in D.C., Congressional Cemetery holds actual events in the cemetery (tours, a foot race, even movies during the summer) to encourage the living to get to know the locals! Unfortunately, the last time I was in Pensacola, I didn’t have enough time to picnic with my guy. But does having coffee with Emmett count? I have new information to share on Modeste Hargis, entrepreneur, professional whistler, and Emmett’s pharmacist! Obituary for Modeste Sierra Hargis. Source: Pensacola Daily News, Jan 22, 1904. I love finding these old obituaries; they often include a sentimental (and perhaps charitable!) description of the deceased’s personality, plus clues about their lives and other family relationships. At the time of Modeste Sierra’s death, she was about 68 years old. Her husband, Dr. Robert Bell Smith Hargis, who was about 15 years older than Modeste Sierra, died eleven years earlier, in 1893. 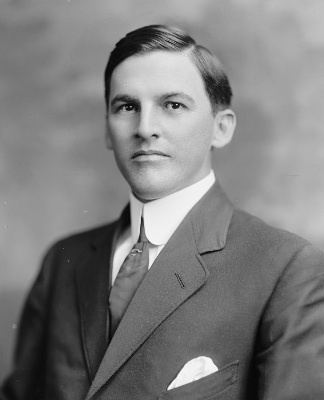 One other item I’ve discovered is that Modeste the Younger had a half-brother, Dr. Robert Whitmore Hargis. Robert is not mentioned in the above obituary; he was the son of Dr. Robert Bell Smith Hargis and Susan Catherine Horton, who died in 1852. (Modeste Sierra and Dr. Robert Bell Smith Hargis were married in 1854.) He would have been about two or three years old when his father married Modeste Sierra, effectively being the only mother he would have remembered. Perhaps he wasn’t listed in the obituary because Robert Whitmore died in 1899, yet Modeste Sierra’s deceased sister is listed. Perhaps it was an oversight, perhaps not; I’m just curious about it. Anyway — what’s interesting about the information at the link on Dr. Robert Whitmore Hargis is that it identifies the name of one of his descendants who possesses the family Bible! I’d love to see that precious primary source in person! First, the actual copyright information for Emmett’s official portrait for his first term in office. Harris & Ewing copyright data for Emmett’s official congressional portrait. The first copyright date of August 6, 1913 is attached to the main photo of Emmett in the upper left corner of this blog. Source: Google Books. Notice that there are two dates. The first date refers to the main photo I’ve used in this blog, in the upper left hand corner. The second date refers to a second photograph/pose. Emmett didn’t sit for the photos in August; Harris & Ewing took the photos of Emmett probably right after he was sworn in, because the second photo (below) appears to be a different pose of Emmett’s original sitting, and it was published in June, 1913 in The Washington Post. From microfilm of The Washington Post, June 15, 1913. From the University of Florida’s archives, as published in The Gainesville Daily Sun, July 19, 1904. The digging continues, and — as we say in the program — more will definitely be revealed/found! Stay tuned!